What to imagine under the name of CANTARINA? The CANTARINA choir was founded in year 1986 under the name „Skøivánek“ (the Skylark). Since year 2002 it has been lead by the choirmaster Mgr. Darina Nováková. 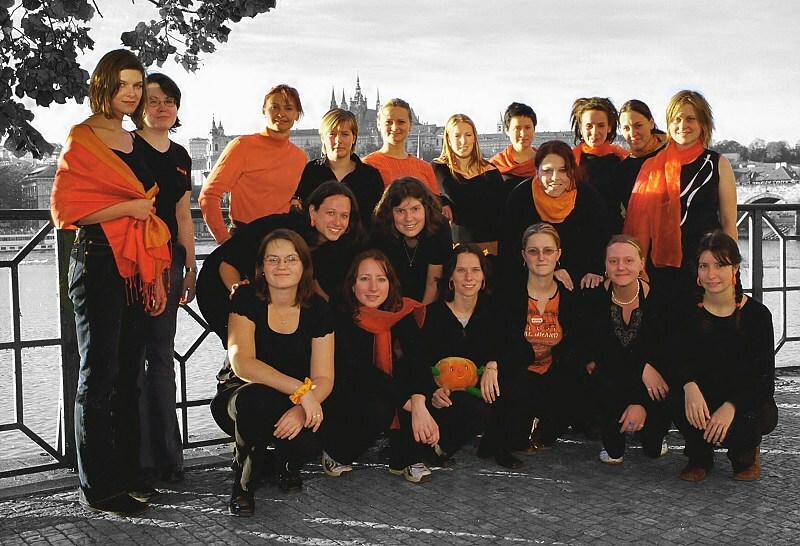 The choir is a member of the Czech choires association. The choir organizes individual concerts or concerts with other choirs. Cantarina regularly attends festivals, competitions, charity concerts and other cultural events. Even though the choir porforms mostly in Prague, it also enjoys the beauty of the whole Czech republic. Cantarina regularly arranges its rehearsals outside Prague (most often in Beroun or Plasy u Plznì). Within the scope of different festivals and competitions the choir visited for instance Klatovy, Švihov, Olomouc, Nechanice, Velké Losiny and other cities. Cantarina likes to travel around the world as well. The choir had its performances on several concerts abroad (Switzerland, England, France, Austria, Germany, Slovakia). But wherever Cantarina is, it loves to cooperate with nice people on interesting projects.